Choose the colour, weight and cut of your Younique Diamond and get your personalized gem according to your wishes. The Augenstern Diamonds is available in four colours. Every diamond is unique in its composition, therefore no two diamons will have the exact same colour. You will choose the tint your diamond should be but the diamond in the end can be lighter or bolder in its colourization. Choose among the most classic cuts your favourite one. Your Younique Diamond will be hand-cut by experts only. The cutting of a diamond is a real craft. Without the exact proportions the diamond will not sparkle. If you would like to have your diamond pristine as it formed itself, you can order a rough diamond (the heart cut is a special cut and is available on extra costs). The size of the diamond does not depend on the amount of hair you deliver to us, but to the duration of the diamond growing process. The longer the diamond remains in the HPHT-machines the bigger it becomes. 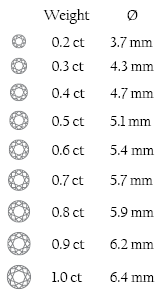 The size of the diamond is indicated by its weight. The weight is measured in carats. You need help to decide on the right options for your personalized gemstone? We are looking forward to assist you. Get in touch with us!